First, you need to brown the sausage in a large skillet, breaking the meat apart as it browns. I used Jimmy Dean sausage and there was very little fat in the pan. You can drain the fat off the sausage, if desired. I drain off the extra fat cuz I don't need it. I do not make a roux with this gravy, I just add the flour directly to the meat. The extra fat will not be missed. Trust me. Just Sprinkle the flour over the meat and then stir it in until there is no flour showing. 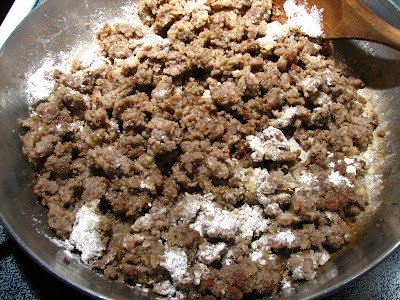 Continue to stir the sausage and flour for a minute, making sure it does not burn. Pour in part of the milk. Stir until the gravy thickens, and then add more milk as needed. The gravy does need to cook and thicken a couple of minutes, long enough to cook the flour, and let the gravy thicken to your desired consistency. I usually end up using at least 2 1/2 cups of milk, or more. It's delicious! Sometimes you just need a plateful of Homemade Buttermilk Biscuits smothered in Homemade Sausage Gravy. It really hit the spot for my busy family. Give it a try! In a large skillet(12 inch), brown the sausage. While it cooks, break the meat apart and turn the meat over as it browns. If the sausage starts to burn, turn the heat down. At this point, I drain off any fat in the skillet if there is any, but you may leave it if you desire.. I'm just for using less fat, if possible! When the sausage is done, sprinkle the flour over the sausage. 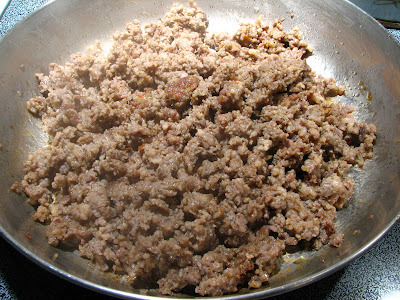 Stir the flour into the meat and keep stirring for a minute or two, while the flour browns with the sausage. The flour will stick some, so it's important to keep stirring. Now, stir in 1 cup of milk and stir until thickened. It will be very thick. Add 1 1/2 cups more of milk. Cook and stir until thickened, several minutes. Now, taste the gravy to determine how much salt and pepper is needed. Each brand of sausage is different as to how much seasoning is added. I do like plenty of black pepper in my gravy. This will serve 4-6. If you desire a larger batch of gravy, add more flour in the beginning, and more milk. Enjoy! A week-end constant for us. I make mine exactly the same way. Your lead photo came out beautifully. Fabulous dish! I love biscuits, usually have them with chicken or turkey gravy, or better yet, butter and maple syrup! I can see how good the sausage gravy would be too. Super good photo. Lynda, this is the perfect recipe for these cold winter days - for breakfast, lunch or dinner. Looking at them warms me up (and we need warming up). Splendid photos - delectable dish. I love biscuits and gravy! One of those comfort foods I make sure I enjoy whenever I'm back in Missouri for a visit! 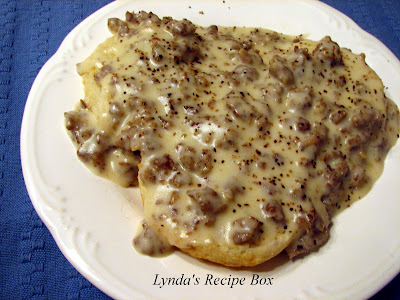 Mmmmm... ya know this gal loves some sausage gravy and homemade buttermilk biscuits! This is right up my ally! I always get biscuits and gravy when we go out to breakfast (it's big here in the south). I have never made it at home and know I should. I think it would just make too much for our family. We only have one 15 year old slender girl, no boys. Seeing your delious looking dish is really making me want to make it. I know a few grown men who are going to love this. Great recipe. This is EXACTLY how I make my gravy!!! soooooo Yummy. Everyone always ohhhh and ahhhhh's over it. I guess they really dont realize how simple it is! You are killing me! This is one of my favorite comfort foods - yum. 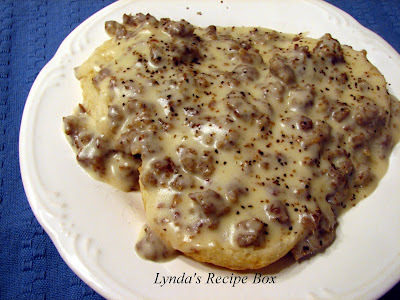 Yum, I love the idea of a sausage gravy! My daughter recently discovered the love for sausage and of course she always loves biscuits so she is sure to love this dish! That looks really good and very do-able. I should definitely give it a try. Is that considered Southern cooking? 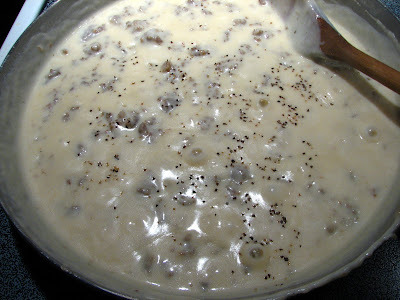 Do you know I do not think I have ever had sausage gravy in my entire life? Will I still be welcomed back here?! Love the directions on making the gravy with the pix. I get all uptight and make a roux and your way is sooo much better; it helps to ensure that the flour is cooked. Love it. Okay, so now I will have to make sausage gravy! Oh Lynda, I will follow your recipe and make this for my boys. They both love sausage and gravy but I have never made it for them! This looks delicious! I can't wait to try it. Thanks for sharing. I'm one of the many posters who make it the same way and pics in my Dec 27 post look very similar yours - cept I left some of the grease in. There must be something to the process or we all had the same teacher. Comfort food at its finest. OMG this looks delicious. I would enjoy this any meal of the day. Natasha Kitchen Puppies, while the south may lay claim to sausage gravy, my grandparents also enjoyed this dish and they were German, so I think it may be more widespread than just the southern states. But, I'm not positive! Big Dude, I read your gravy post and sure enough, we do this gravy the same way! Grace, oh yeah, it's perfect for lazy days! I wish I had some of this right now! Looks fantastic. i did the same way but i put some bacon grease in it and wow it was good. thank you linda.